At last, an affordable way to reload the monster 50 BMG. 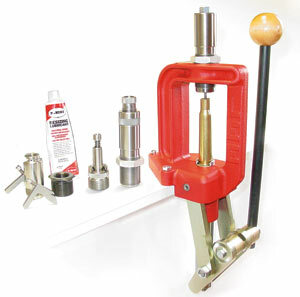 This kit includes everything you need to start reloading the 50 BMG, the Lee #90998 Classic Cast Press, set of #90515 50 BMG Dies, #90903 Shell Holder, #90901 Ram Prime Tool and tube of #90006 Case Sizing Lube. Kit also includes shell holder insert, large and small primer arms and die reducer bushing to accept standard 7/8-14 dies so you can load all your smaller cartridges. All this for less than what others charge for dies alone.